Thailand has a rich history as one of the world’s most prominent centers for gems and jewelry and is well known for its high-quality manufacturing. The Bangkok Gems & Jewelry Fair is a vital conduit for Thai gem and jewelry exports, the third biggest export earner of the Southeast Asian country. Thailand is celebrated for its supreme craftsmanship and manufacturing capability in colored gemstones and gold and silver jewelry. With the emerging role of ASEAN markets, the DITP believes that Thailand can be internationally competitive due to its advanced facilities, efficient transport links, special tax benefits and, most importantly, its heritage of excellent craftsmanship, quality and design. Thailand is well-positioned for upcoming trends, such as Fast Retailing. Special orders with the help of 3D printing will help to speed up the model making progress, leading to changes in manufacturing processes. Hong Kong remains Thailand’s number one trade partner in gems and jewelry, accounting for roughly one-quarter of the sector with an export value of USD 2.08 billion. These purchases were primarily in diamonds, gemstones and gold jewelry respectively. 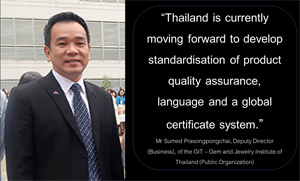 In recognition of the industry’s significance, the Department of International Trade Promotion (DITP), Ministry of Commerce of the Royal Thai Government, is ready to promote the 64th Bangkok Gems and Jewelry Fair to be held from September 10-14 2019. “The DITP is working relentlessly to improve the look and content of the show, as well as facilities and services, in order to ensure that the BGJF continues to serve the needs of the industry and the market,” said Mrs Chanunpat Pisanapipong, Thai Trade Center (TTC) Hong Kong Executive Director. 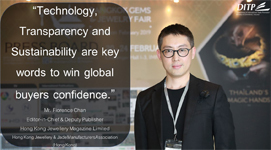 “The skills and workforce in Thailand are not only comparable to international standards, but also are hard to match anywhere else in the world,” said Mr. Ng King Hon Kevin, Chairman of the International Jewelry Designers Association (Hong Kong). PANDORA, which is made in Thailand, is a prime example of a Thai-manufactured brand that is doing well in the Hong Kong market. For Thai exporters, there is potential in Thai color stone exports to Hong Kong, bolstered by the zero import tax system to China, according to the DITP. Mr Prida Tiasuwan, Chairman of Thailand’s Pranda Group, a leading manufacturer, said he believed that the DITP was right to focus on Thailand’s craftsmanship as these skills, developed over generations, give Thailand a strong competitive edge in the global marketplace. “I hope that we will continue to see the excellence of Thai craftsmanship running as a highlighted theme at the Bangkok Gems & Jewelry Fair,” Mr Prida said. 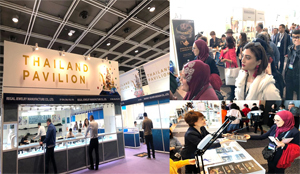 The Bangkok Gems and Jewelry Fair gathers more than 15,000 visitors from some 118 countries to order the latest products from Thai companies and brands, including manufacturers, trading companies, distributors, wholesalers and designers. The September show will be an unrivaled opportunity to source from a vast selection of jewelry, gemstones and diamonds, pearls, as well as state-of-the-art machinery technology, display materials and packaging. “Visitors who had been invited to the Bangkok show from Hong Kong are mostly niche buyers. Thai exhibitors should prepare themselves with full details, such as export knowledge, documentation and quotations. 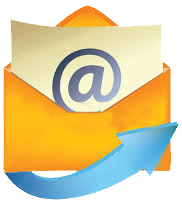 In addition, as most Hong Kong buyers have high expectations of receiving prompt feedback, having instant/real time interaction with customers via email or multimedia platforms, will be extremely important to build trust. added Mrs Chanunpat. The 64th Bangkok Gems & Jewelry Fair will be held from September 10 to 14, 2019 at Challenger Halls 1-3, IMPACT Muang Thong Thani.